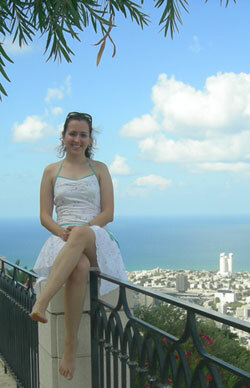 The United States Chess Federation - Irina Blogs from Israel: Part II. Home Page Chess Life Online 2006 October Irina Blogs from Israel: Part II. My cousin drove me from Tel-Aviv to the Ashdod International Chess festival (September 10-17). A minute after we pulled out of my hotel, and were driving along the beach promenade, I spotted Israeli GM Ilya Smirin crossing the street, heading towards the beach. It’s a small country! Ashdod, like Tel-Aviv, is a port city and it’s located about an hour’s drive south of Tel-Aviv. Ashdod is home to many immigrants from the former USSR; they make up about a third of the city’s population. Our hotel was located right across the street from the beach, just like my hotel in Tel-Aviv. Unfortunately, the rounds usually began at 4 PM, so by the time they were over it was a little late to go swimming, or in any case my beloved sunsets were long gone. Ashdod was actually quite an unremarkable tournament for me. I won 3 games, lost 1, and drew 5. As is typical for a Swiss, two of the wins came early against weaker players. On the positive side, I got to play three GM’s, including the highest ranked player in the tournament (Smirin, 2659). For me that was the toughest and most memorable game. Though I was White, I was on the defensive right from the opening, having very little familiarity with his chosen line 1.d4 d6 2.c4 e5 3.Nf3 e4 4.Ng5 f5. The rest was just improvisation on my part, but since White needs to know what she’s doing in this unbalanced position, Smirin emerged from the opening with a superior game. So I tried hard to defend, and at some stage the game went really in my favor. In the final position, where I agreed to a three-move repetition, I am much better after 41.Qd3, but with only a few minutes left for the whole game (in Ashdod the FIDE time control of 90+30 sec increment was in effect) and having some bad memories of recent games that I’ve given away in time trouble, I decided to play it safe. Actually, playing it safe in time trouble was the leitmotif of my tournament, since I did the same thing in my game against GM Konstantin Lerner, where I was easily winning in the position I agreed to a draw in (but with the seconds ticking down, I didn’t quite reach that conclusion). So on the one hand, I didn’t have any disastrous time trouble screw-ups, but I didn’t do a good job of converting my opportunities either. Hence, the unremarkable result. But someone who did do a good job with his opportunities was the tournament winner, Emil Sutovsky! Among Emil’s major chess successes are the titles of World Junior Champion (1996) and European Champion (2001), and, more recently, winner of the 2005 Aeroflot Open. A few years ago, Emil reached his peak rating of 2697, but since then he’s shed a lot of points, going down to his current rating of 2607, which in my opinion makes him the most underrated GM in the world. Emil’s recently become a family man, so maybe his changed priorities have something to do with his rating drop. Emil is known in the chess world for his dynamic and aggressive play; he has a great feeling for the initiative and his games are full of sacrifices. When he wins, he wins in style. So it’s rather funny that in Ashdod Emil collected all of his important points in the endgame! The most impressive was his win over GM Mikhalevski in the Open Spanish, an opening in which Mikhalevski is a specialist. Emil told me that the position had been previously reached up to White’s 16th move (Mikhalevski made his own path with 16…Rb8), but that both players had played quickly until move 25 as they were still in their preparation. Mikhalevski had trusted Fritz’s judgment that the endgame was equal, while Emil had evaluated deeper and preferred White’s chances. Emil showed good endgame technique to convert the position from simply better to a full point (in particular, watch how Emil fixes Black’s kingside pawns with h4-h5). Going into the final round, Emil was leading by half a point, but there were many players right behind him, including his last round opponent Jan Ehlvest. To my surprise, Ehlvest, who had the Black pieces, didn’t try to win and the game was drawn in a few minutes, ensuring Emil of at least a tie for first (basically all the money lay in the first prize, so Emil didn’t have a lot of incentive to play and risk losing and winding up with nothing). Now, I know it’s not an easy task to beat an in-form GM with Black, but still, the difference between what would likely be a tie for first place and anything else was so huge that I think you had to try. If Ehlvest would’ve won, he would’ve gotten $8000, while by drawing and allowing others to catch up to Emil, he probably got not much more than $1000. In their match-up, it seemed to me like only one Emil had something to lose. Emil had been having a very good tournament, but clearly he’d feel some unpleasant pressure knowing that one stumble at the end would nullify all of his efforts. Meanwhile, there were three other pairings of players with 6 out of 8 that could produce a co-winner; Rodshtein (2494)-Smirin (2659), Murey (2482) –Mikhalevski (2571), and Paveliev (2403) –Kogan (2567). An examination of these pairings reveals that there are quite large rating differences between the players, so decisive results are likely. And in fact, that’s exactly what happened: the higher rated player won, meaning that Black won in every encounter! Black is indeed OK! Thus, Israeli GM’s Smirin, Kogan, and Mikalevski joined Emil at the top of the rankings chart, but Emil took home the trophy as a result of his superior tiebreaks (he had played by far the strongest field). The final round also happened to be the day of Emil’s 29th birthday. I was happy to leave Ashdod and get on with more sightseeing. In my last two days in Israel, I got in some shopping (bought two nice pairs of earrings), returned to the beach in Bat-Yam, and left the most packed itinerary for the day of my flight, when I drove up to Haifa with my cousin, and made a stop at the beach in Caesarea on the way back. On a Haifa bus, an old woman got on, and on her bare left arm tattooed numbers were visible, identifying her as a concentration camp survivor. Irina on a day off. An orthodox couple looking over Haifa. The Bahai Shrine in Haifa, a symbol of Haifa the way that the Twin Towers were of New York.